Buying or selling a vehicle is a straightforward event. It requires you to follow an easy procedure and handle paperwork for vehicle registration and titling with the Nevada Department of Motor Vehicles (DMV). If you are selling more than 3 vehicles in a year, consider yourself a dealer. What you need to legalize your business is to obtain registration for your business. Conducting your business as a licensed Nevada car dealer will give you more benefits. If you are selling a vehicle as a private party, you should give the buyer a signed-off title. The buyer will need this document to register and title the car in his or her name. If the title is missing, apply for a duplicate copy with the state and sign it over to the buyer. If the vehicle is more than 9 years old, a duplicate copy is not required. In that case, the buyer will need to submit Form VP 012 (Application for Duplicate Certificate of Title) and Form VP 104 (Bill of Sale) in order to register and title the car in his or her name. When preparing the title, all owners should sign it. You should also prepare the bill of sale and give it to the buyer. Make sure you have remained with copies of both the title and bill of sale for your records. Remove the license plates from the vehicle after sale. License plates belong to the seller, so you can transfer them to another vehicle or return them to the Nevada DMV within 30 days. After selling your vehicle, the buyer will be responsible for purchasing insurance policy for the vehicle and obtaining emission inspection certificate. You can also sell your car to vehicle dealer. The dealer will need to satisfy any liens on your vehicle within 30 days. If the title is missing, the dealer may give you to sign power-of-attorney documents to complete the sale. 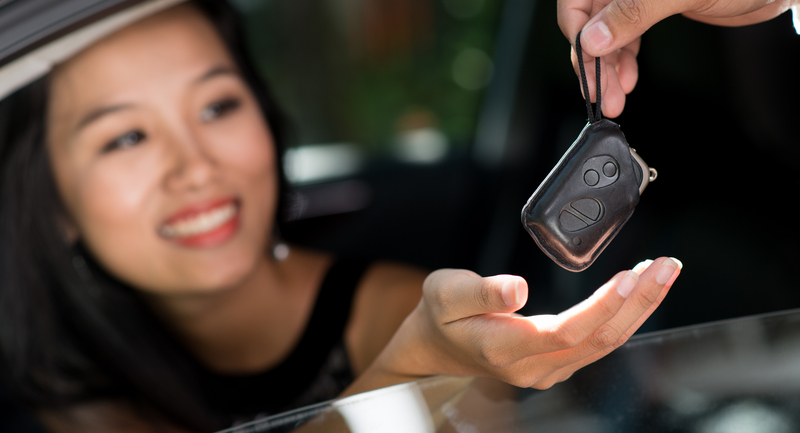 After trading in your car, the dealer has to remain with vehicle until financing is processed. If the dealer is unable to get a financier, they dealer can return the vehicle to you. When you purchase a vehicle from a private party, you will be responsible for handling paperwork for vehicle registration and titling. Be sure to obtain a signed-off title from the seller. If the title is missing, ask the seller to apply for a duplicate title and give it to you. However, vehicles that are more than 9 years old are exempted from title requirement. Simply fill out and submit Form VP 012 (Application for Duplicate Certificate of Title) and Form VP 104 (Bill of Sale) to the DMV in order to register and title the car in his or her name. Do not purchase a vehicle with a salvage title. It is illegal also to sell such vehicles to private dealers. If the vehicle seller wishes to be enjoined on the title until you complete payment, he or she will need to fill and sign the lienholder section of the title. The new title will be issued to the existing lienholder. In case the vehicle is being sold again, the existing lien holder must sign-off the title and release the lien in order to complete the sale. If you are financing your vehicle through a bank loan, the bank will handle the title transfer paperwork with the DMV. The new title will be sent to the bank and they will hold it until the lien is satisfied. You will be allowed to register that vehicle using the bank’s security agreement forms. After purchasing a vehicle, you will be required to purchase the minimum car insurance cover for that vehicle. You will also be required to obtain a temporary permit in order to legally drive your vehicle until registration is processed. You’ll be issued with a movement title after submitting your security agreement or title to your local Nevada DMV office. The law does not require sales tax to be collected on vehicles sold by a private seller. Copies of contract, warranty and lease agreement. Drive train inspection report if you had purchased a used vehicle of more than 75,000 miles. Dealers Report of Sale (DRS) (green slip). If you have not arranged financing, the dealer will remain with the Dealers Report of Sale (DRS) until arrangements are finalized. The dealer will be responsible for handling all the paperwork for vehicle registration and titling. This must be done within 30 days from the purchase date. Invoice or Bill of Sale. Nevada emissions certification, if needed. Either the title, security agreement, Manufacturer's Certificate of Origin, lease agreement or purchase order. Registration papers are not required during the time of sale. However, if the vehicle has never been registered or title in Nevada, the buyer will need to provide the VIN inspection certificate.